. . . because he screwed it up. Thanks to Morgan Freeberg over at House of Eratosthenes — shows he’s a fair player (I doubt he’s got much sympathy with the CSCOPE project). 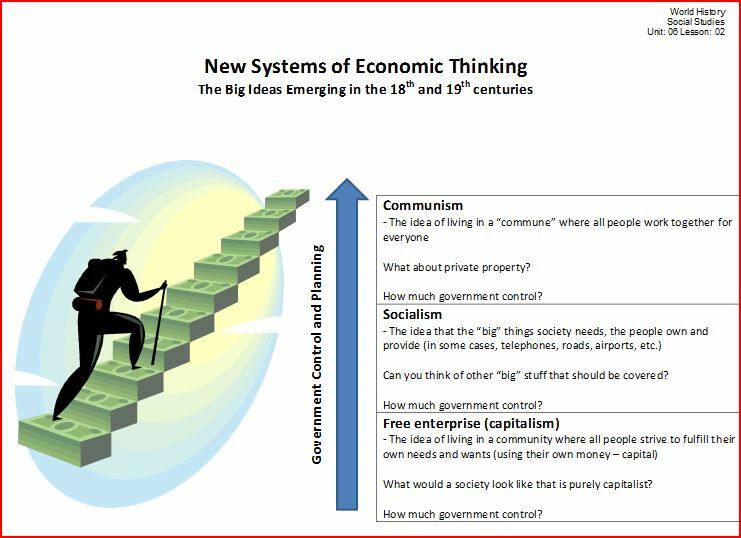 CSCOPE chart on rise of economic systems in the 19th century that critics claim, erroneously, promotes socialism and Marxism. This is copyrighted material, posted here in the interests of correcting false claims. Will CSCOPE complain? Clarification of David Barton’s Statements on the Glenn Beck Show (educationviews.org) Donna Garner’s confession that Glenn Beck’s and David Barton’s complaints are about material that is NOT in CSCOPE, or that is now outdated; no apology from her, however. At long last, Sen. McCarthy Little Green Footballs, have you no decency? One wonders just how much mob activity these guys can provoke before somebody — perhaps someone at LGF, and Michelle Malkin’s blog — wakes up and stands up to stop the madness. Rachael Ray wore a black and white patterned scarf at a shoot for a Dunkin’ Donuts ad. As a Blood to a blue bandana or a Crip to a red one, LGF pulled out their rhetorical guns and started firing. ‘Aren’t those the colors of Yassir Arafat’s group, Al Fatah?’ LGF wonders. You couldn’t make up this kind of craziness if it didn’t exist. Well, almost couldn’t make it up. I expect that, next, Little Green Footballs will hear that some radio stations are suppressing the news about the invasion of Martians. Next week: Little Green cake pans filmed flying across LGF’s yard, and LGF leads a new dig at the old quarry in Piltdown. How long before Nebraska Man shows up in the credits to Michelle Malkin’s blog, and they start rooting for the Cardiff Giant during the Hall of Fame Game in Cooperstown? Is it true that Michelle Malkin has an interview with Judge Crater set up for later this week? Dunkin’ Donuts pulled the ad rather than risk offending anyone. The scarf had a paisley design, a company spokesman told LGF — and no one disputes that. Does anyone else see the irony of Little Green Footballs complaining about this and inciting a mob? What will they do when they realize that green was Mohammed’s favorite color, and is almost an official color of Islam? And when the truth comes out, will it be that LGF was mainstreaming terrorism to sell Little Green Footballs — like mob action against a donut shop — occasionally outing one of their friends or some innocent person to avoid suspicion themselves? Santayana was right. What do you know about Herb Philbrick’s dip into communism double agentry, in I Led Three Lives? What do you remember about Robespierre and the Summer of Terror? What do you remember about Stalin’s installation of terror in the Soviet Union? Why aren’t Malkin and LGF going after Rev. Moon, or some real threat to something — whooping cough, measles, something really dangerous? Whose side is Little Green Footballs on, anyway? 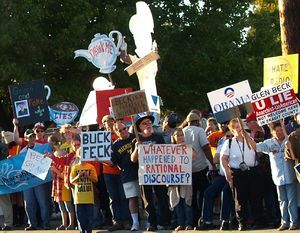 Tip of the old scrub brush to Dispatches from the Culture Wars. Update: Greater, sadder irony: Rachael Ray’s site today featured a nice tribute to our troops, with recipes.